Well friends, it's that time of year again - Valentine's Day! Bringing with it an overload of pink, hearts and sugar. I love all of the typical Valentine traditions, and have especially become a fan of the rise in popularity of Galentine's Day celebrations. I am a singleton, and love that I have an excuse to celebrate the holiday of love with my best lady friends. 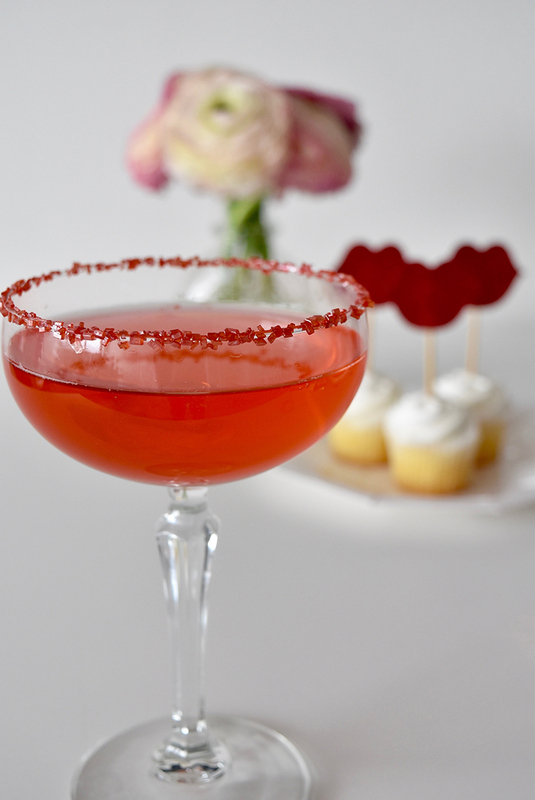 For my Galentine's Day celebrations drink idea, I had to go with a champagne-based cocktail recipe, because i'm sure that we can all agree that nothing says Valentine's Day like some bubbly. To take it one step further, I decided to make the drink girly and red. No explanation needed. Thankfully, we had some leftover pomegranate juice in the LMP studio fridge, which I used to give this cocktail some color. Here's what to do: 1) Sprinkle some glitter onto a flat plate. 2) Wet the rim of your glass, and then dip into the plate of sprinkles to garnish your glass. 3) Pour some strawberry soda into each glass, about 1-2 inches worth depending on how big your glass is. 4) Fill the rest of each glass with your sparkling white wine. And that's it! You should get a nice deep pink or red color from mixing the strawberry soda in there. This cocktail is light, sweet and simple, and perfect for sipping and sharing with your girlfriends! To style this bad boy, I took some conversation hearts to line the bottom of a tray, which added some pops of color and dimension to my drink display. Also adding some color were these gorgeous ranunculus, which we had used for a Bat Mitzvah last weekend AND a special Valentine's Day brunch that we had in our studio. Those flowers just kept on giving! I also thought it would be nice to serve these drinks with some mini vanilla cupcakes, which I topped with red glitter lip toppers, and placed on a white paper plate with silver stars, both of which can be found in our Pink Party in a Box! Be sure to grab your own Pink Party for all the decor and tableware that you need to throw a chic Valentine's Day celebration. Happy Valentine's and Galentine's Day to you all! Hooray for Little Miss Party!